Calling all of my brilliant readers! I need some help figuring out a project. It started with a fur coat I bought at the thrift store last year. I noticed it on my way out the door and went back to check it out, then paid $12 for it. It was a darling style, but as I guessed it didn't fit me. I didn't really plan on wearing it when I bought it, anyway. I wish I could find the photo of it, but I seemed to have misplaced a memory card! With all of the Mongolian Fur pillow craze, I thought this coat would be perfect to take apart and refashion into pillows! 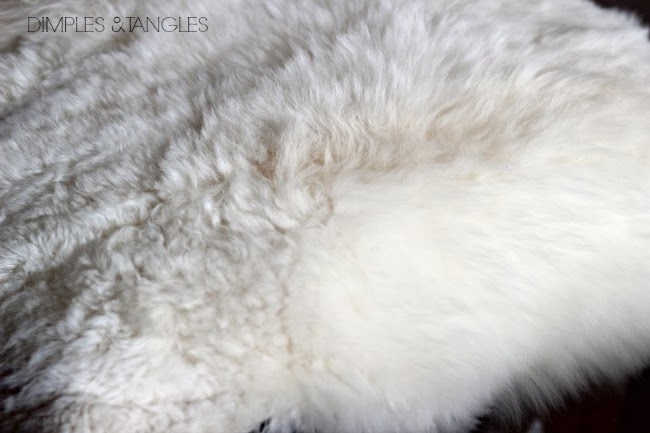 The fur is really pretty and soft, and varies from tight and shorter to long in places. I planned to make a square pillow and to make bolster pillows with the sleeves, but they ended up not being big enough around. I had plans for the fun collar, too. So, after the collar was off I deconstructed the rest of the coat until I was left with 5 pieces from the sleeves, front, and back. There weren't any labels or markings inside the coat, so I don't know what kind of fur it is. I even took it to a local furrier and they didn't know, so I hope I didn't blow it taking it all apart! As I was trying to determine how to make the best use of what I had and what shape to make the pillow, I had another thought. 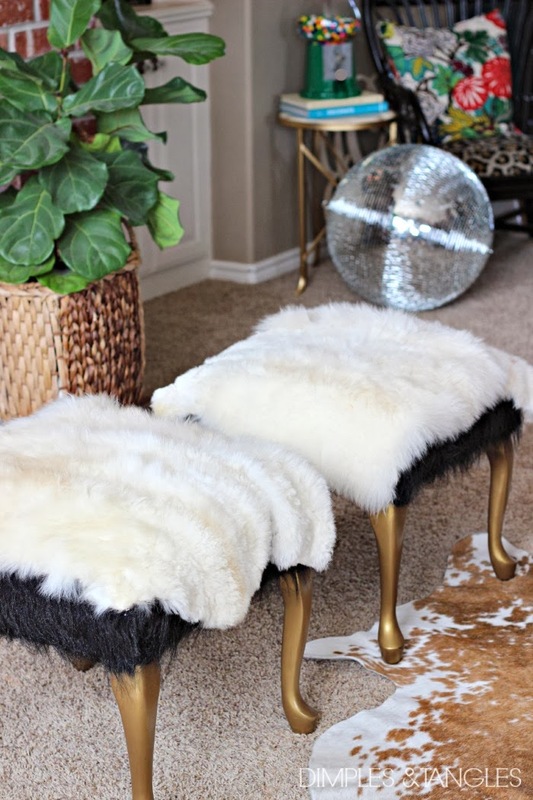 It's time to recover my black fur stools, and I've kept an eye out for an old fur coat at thrift stores to use. In my mind I was thinking it would be a darker color, but it never occurred to me to use THIS fur coat. Bingo! With this image in mind, I gave my pieces a trial run on the stools. They cover the tops and even part of the sides, but I don't have enough to completely cover the stools. So, I thought about using a similar fur to patch in around the sides. I have some Ikea faux sheepskin rugs, but they're not quite the right color and are noticeably different than the real fur. I thought a real Ikea sheepskin rug might work, and it does actually blend in nicely, but they are TINY and it would take 3 probably to get the coverage I need. At close to $100 for those 3, no thanks. So, here's my question. Do you have any ideas of what I could use around the sides? I need some kind of faux fur but I don't have any good resources for where to find some that might be a little nicer than normal. Any thoughts? Who knows. I might have to ditch this plan and go back to my original pillows! i wish i had a brilliant thought but i don't! but seeing the disco ball in the back has me thinking you could mix it with something fun like silver sequins? What a fun find! Why not use another fabric, maybe a velvet or even a pretty linen? It looks like the top has a boxy shape making it easy to pull off! First of all - great idea on a wonderful way to use the fur coat. I'm gonna suggest using a totally different fabric underneath - linen, velvet, chenille, leather, even a designer cotton and then putting the fur on top in a funky shape - I kind of like the look you have going with the white fur just draped over. No it's not the same as the inspiration photo but I think it might end up looking better to do something like that than trying to patch it in with another fur. unless of course you find one that blends so well you can't tell you are using two different furs. you could even recover with whatever fabric you end up choosing and then just hot glue the fur pieces in place - Oh how I wish I could just pop over and help you in person cause that looks like such a fun project to play with! Good luck - I know you will come up with something wonderful cause you always do! I'd use a different fabric in the same color and drape the fur. I like Cathy and Jill's idea of velvet. How fun!! Great find! Maybe a low contrast white greek key trim around the sides? I love the idea of using them for pillows too!! I like the idea of them draped over the stool like they are now, in kind of an organic shape that looks natural - like the one on the left, with a base color that doesn't contrast with them. Let them be the stars of the show! I have no clue on fur resources but I always think that if something is meant to be it works out easily so maybe these pieces are just destined to be fabulous pillows! Yes, if it doesn't seem to come together right, pillows are definitely my back-up plan! What if you found a heavier weight fabric in white (matching the fur) for the side pieces and just made the tops out of the fur? I actually like the look of the black and white together as they are in the photo, but if you want it to be all white, the fabric on the sides might be the answer. Thanks LInda, I'm really liking that suggestion from everyone! Hmmm, that's an interesting option! Thanks Janet, I'll check it out! Pillows would be one way to use it. Drape it. 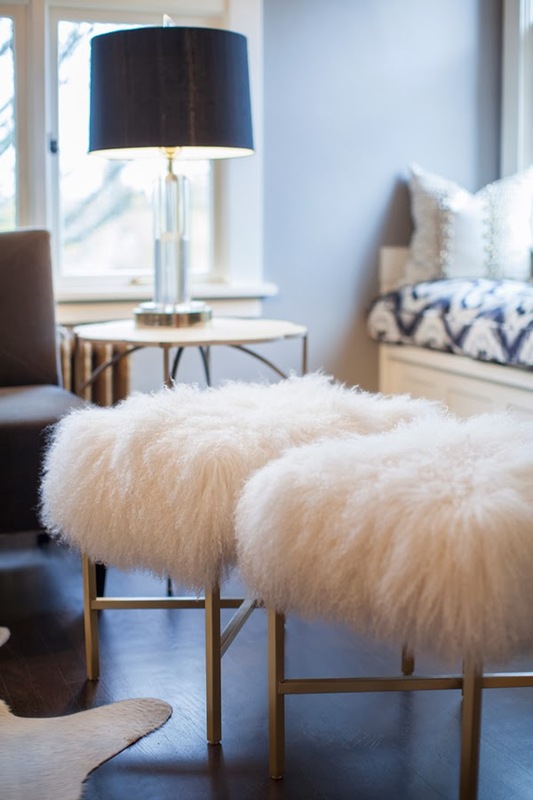 Or take another type of fur and use that fur as the sides of the stools and use the lovely white as the top. I think I would try and make them as "tailored on the sides as possible, use a fur with a shorter coat. A leather or ostrich look could be really lovely as well. Those are my thoughts. Enjoy your blog, just found you a few weeks ago. Love your use of color. Oh, I like the leather or ostrich idea too! Thanks so much, Barb. Glad you're following along! I was thinking of a cafe au lait colored suede or faux suede to upholster, then use the fur as throws for on top. The suede would be just dark enough for contrast, but creamy enough to look like absolute luxury! I'm sure you'll f ind a beautiful solution! Why not do a graphic black and white and keep the bottom in your current black fur and add the white fur to the top, maybe with the edges more squared off for a graphic look. I think I would sew your fur to a piece of coordinating, but not matching fabric, and then upholster the stools. It would look like a double layered fabric, but would be really cool! Great find! How about pillows with a vibrant linen fabric. Fur will stick to velvet! Ooooh, good point with the velvet. Hadn't thought about that! I vote for going back to the pillow plan - I love Jennifer's idea of a vibrant color on the back! I'm just not feeling it on those stools BUT you always come up with the most creative solutions for things so I wouldn't be a bit surprised if you figure out a way to use it that makes those stools amazing. Can't wait to see what you do! Oh my, that coat is amazing! This one has my wheels spinning! Very cool idea, thanks Karla! If you decide to use the fur how about suede underneath? I don't think you can find any faux fur that will blend in. I vote for the pillow plan too. Hi Jennifer, I have noting new to add...just wanted to say 'hi' and that I will be watching to see how you solve this. I like everyone's idea about a different fabric. I have found faux shearling at Homegoods. One piece is 16.99 and should be able to cover both stools on the sides. What if you used some leather or faux snake skin of something to trim it off. Maybe something like this? I like the idea of layering it with a different fabric Fur pillows would be great too! You can't go wrong either way! I'm with the pillows and maybe do the stool in a Velvet with a color brought from another room. Could you tell me what color/brand paint is in your foyer?